We currently accept cash only. Minimum 2 kayakers per trip. 24-hour notice required for groups of 5 or more. We offer group river trips with reservations made by phone or email. 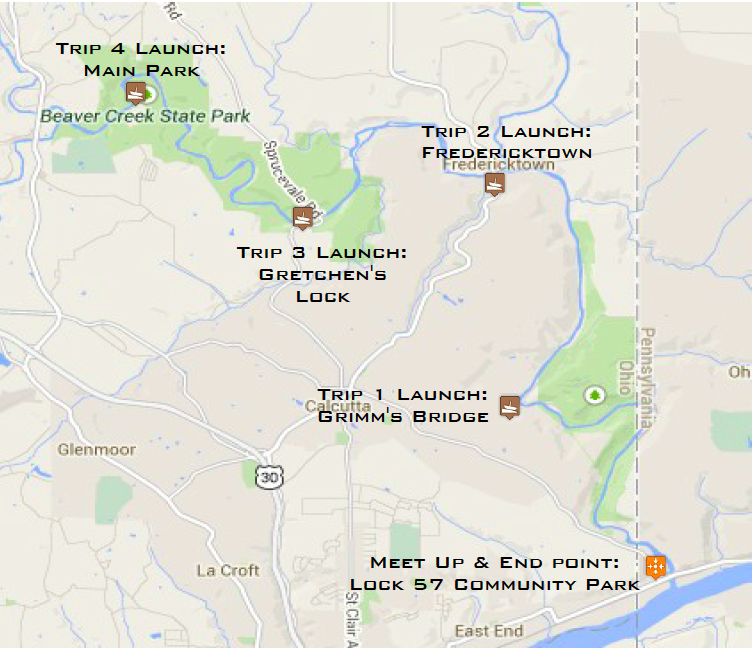 We meet your party at the Lock 57 Community Park and provide transportation to your designated launch site. At the end of your trip we meet back at Lock 57 Community Park where your vehicle is parked. Our kayak trips on the Little Beaver Creek are a “get wet” adventure through isolated and difficult to access forested areas. All kayakers should be swimmers, prepared for immersion in water and capable of self recovery (standing up in rocks and retrieving your kayak and paddle). There are very few points along the Little Beaver Creek that are accessible by road and most of the creek does not have cell service. This area is pristine and primitive. You will be paddling through nature with your fellow boaters and very few others. If you or someone in your group is concerned that they may need medical attention from a pre-existing condition, kayaking the Little Beaver Creek is not the right trip for you. Please contact us and we will discuss the concerns and see what other options are better suited for your group. We have options available for non-swimmers-just ask! Not ready for a full trip? Our Guided Mini-Trip includes our guide and instruction for a mile long trip with calm water, some mild riffles and a Class I- II rapid for $20 per person. Safety Guide (CPR, First Aid) is available for any trip for $30/hr.